These edited extracts are from Paget's own account, The Light Cavalry Brigade in the Crimea Extracts from the Letters and Journal of General Lord George Paget (John Murray, 1881). Alvin Wee of the University Scholar's Programme, created the electronic text using OmniPage Pro OCR software, and created the HTML version. Edited and added by Marjie Bloy, Ph.D., Senior Research Fellow, National University of Singapore. This noble brigade was on its way to cross the Balaclava plain from our rear (where it had been formed up in our support), with the object of giving support to the 93rd Highlanders, whose position was seriously threatened. It had just reached the level of the plain beneath us, when large masses of the enemy's cavalry appeared, rapidly advancing, and debouching, as it were, from the plain which was afterwards the scene of our charge; having crossed the ridge of redoubt hills at a point where. the undulation of the ground leaves little rise from the plain itself. These columns must have crossed our front obliquely, the undulations of the ground accounting for our — at all events my (for I speak only of what I saw) — not having seen them before they were close upon the Heavy Brigade. This advancing column could not have been 300 yards from the Heavy Brigade, when they first came upon their view. These last were at that moment in the act of executing their flank movement, and close on their left (between them and the enemy) were the remains of a vineyard. Any one who has ridden, or attempted to ride, over an old vineyard will appreciate the difficulties of moving among its tangled roots and briars, and its swampy holes. But these did not stop these noble fellows. They were caught in a position and formation quite unprepared for what was to follow, aggravated as this was by the nature of the ground. They immediately and most skilfully showed a front to their left, and advanced across the vineyard to meet a foe of many times their number. It must be here observed that the confines of this vineyard were just on the line where the shock took place between the two advancing bodies; or rather that the Heavy Brigade had only just time to scramble over the dry ditch that usually encircles the vineyards, when they came in contact with their foes. I am now about to describe only what I saw! — This has been called a charge! How inapt the word! The Russian cavalry certainly came at a smart pace up to the edge of the vineyard, but the pace of the Heavy Brigade never could have exceeded eight miles an hour during, their short advance across the vineyard. They had the appearance (to me) of just scrambling over and picking their way through the broken ground of the vineyard. Their direct advance across the vineyard could not have exceeded eighty or one hundred yards. What a thrilling five-minutes (for it did not last longer) was the next — to us spectators! The dense masses of Russian cavalry, animated and encouraged doubtless by the successes of the morning (for the poor slaves had been told that the Turkish redoubts had been taken from the English) — advancing at a rapid pace over ground the most favourable, and appearing as if they must annihilate and swallow up all before them; on the other hand, the handful of red coats, floundering in the vineyard, on their way to meet them. Suddenly within twenty yards of the dry ditch, the Russians halt, look about, and appear bewildered, as if they were at a loss to know what next to do! the impression of which appearance of bewilderment is forcibly engraven in my mind on this occasion, as well as later in the day. They stop! The Heavies struggle — flounder over the ditch and trot into them! Then followed anxious moments! "red spirits and grey," green coats and blue! all intermingled in one confused mass! There is no more show of resistance, and they soon disappear to whence they came. It was a mighty affair, and considering the difficulties under which the Heavy Brigade laboured, and the disparity of numbers, a feat of arms which, if it ever had its equal, was certainly never surpassed in the annals of cavalry warfare, and the importance of which in its results can never be known. It is due, however, to say that this attack of the enemy's cavalry was of a most daring character, when the extent of their advance from all support is considered, and that they thus attacked us positively in our own lines! Pity for their character that so dashing an advance should have been followed by so wretched a result! In the camp-discussions that followed this affair, it was said by some that the Heavies might have followed up their advantage. Little did those who said so consider the task that had been already accomplished. It was made a charge also against the Light Brigade, and with somewhat more show of reason, that they did not follow up the advantage gained by their gallant brethren in arms, by cutting off the retreating foe. Opinions differ on this point, the majority leaning to this opinion. I must own to being in the minority, and I will give my reasons. 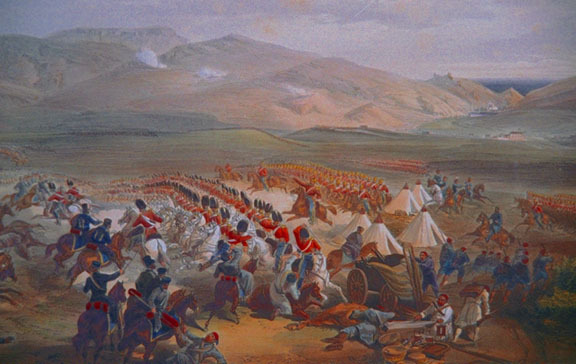 The Light Brigade was some distance from the scene of action — parallel to, though if anything rather in the rear of it. They were, besides, on ground considerably more elevated than that on which the combat took place. To have effectually cut off the retreat of the enemy, or to have even harassed them in their flight, more than a quarter of a mile of ground to our right front must have been gained, and that down a somewhat steep and broken descent. Had the Light Brigade moved off its ground the moment that the enemy first appeared in sight, their retreat might certainly have been cut off. But clearly such a step would have been unjustifiable, until the result of the combat was known, and certainly the probabilities were against the actual result; added to which, they were in expectation of, or rather on the watch for, an attack from another direction! Could it then have been foreseen that the affair — would terminate as it did, the Light Brigade (at least its first line) might have been made available. (1) I must acknowledge that subsequent information gained by conversations with some who were in the first line, have tended to shake my confidence in my own opinion. Certainly the contrary opinion is very general among those who, being in the first line, were in a better position to judge than myself; and there is no doubt that Captain Morris, commanding 17th Lancers, and others, did urge Lord Cardigan to move. It must be borne in mind that I was with the second line, some little distance in the rear, and that my impressions at the moment were taken from that position, and it is on this ground that I am not tenacious of my own opinion. I have dwelt at this length on this subject, as it was one on which there was much controversy at the time.